Preheat oven to 220°C (425°F). Line a large baking tray with non-stick baking paper. Place half the pumpkin, cut-side down, on a chopping board. Place a chopstick, lengthways, on each side of the pumpkin. Using a very sharp knife, carefully slice through the pumpkin to the chopsticks at 5mm intervals. Repeat with the remaining pumpkin half. Place the pumpkin on the tray, cut-side down, and drizzle with the oil. Cover tightly with aluminium foil and roast for 1 hour. Uncover and roast for a further 20 minutes or until golden. Place the honey, vinegar and bay leaves in a small saucepan over high heat. Bring to the boil and cook for 4–5 minutes or until slightly reduced. 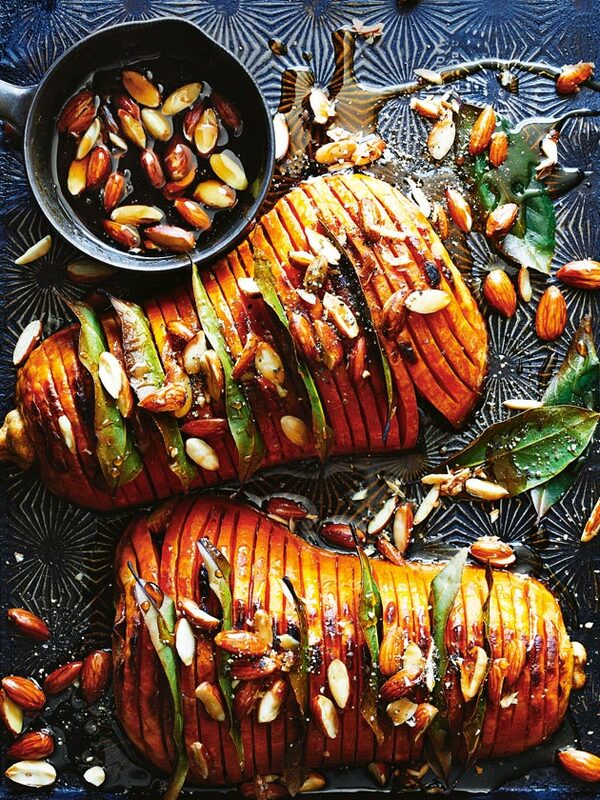 Spoon half the honey glaze over the pumpkin and place the bay leaves in the incisions. Roast the pumpkin for a further 5–10 minutes or until tender and golden.